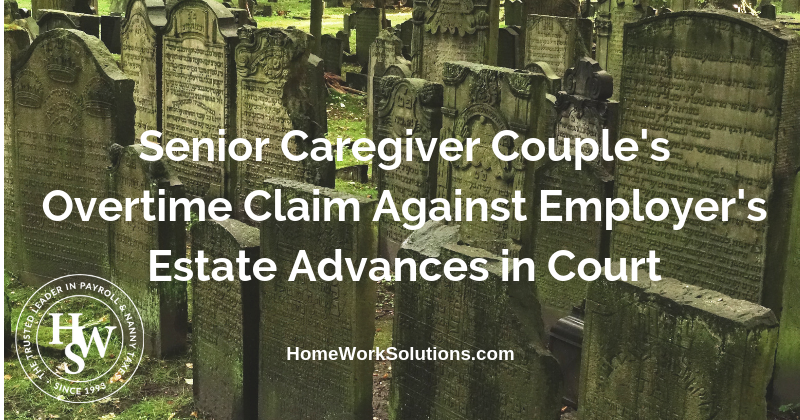 A federal district court ruled October 15, 2018 that a senior caregiver couple's unpaid overtime claim against the estate of their deceased employer may proceed. In the case of Stalnaker v. Estate of Beall, the married senior caregiving couple alleges that they were not paid overtime wages due them in violation of the Fair Labor Standards Act and West Virginia labor laws. According to the facts presented, the couple's duties included general household maintenance, grocery shopping, cooking and cleaning as well as senior caregiving tasks such as bathing and dressing, attention to the employer's medical needs including physical therapy and transportation to medical appointments. The senior caregivers claim they worked about 84 hours a week, that they "were daily covering opposite 12-hour shifts," and they were paid the same wage regardless of the number of hours they worked. When they approached their employer's widow in their efforts to recover unpaid overtime wages, the widow claimed the couple were not covered under the FLSA because they did not engage in interstate commerce and that West Virginia law provides that the personal representative of an estate cannot be held personally liable "for any debt or demand against the decedent" after the distribution of the estate "unless, within the time fixed for presentation of claims or for suing thereon, such claim was duly presented or action or suit thereon commenced and process served on such personal representative." W. Va. Code § 44-2-23 . The federal district court ruled on the first claim that the couple were in fact FLSA covered employees because they engaged in telephone communications across state lines, sent and received correspondence from various states, and delivered and picked up legal and business documents affecting the employer's commercial activities. Such activities are sufficient to show that the couple were engaged in interstate commerce for the purpose of individual coverage under the FLSA, the court said. The defendant, Estate of Beale, also entered a new argument in their reply brief that Plaintiffs are not entitled to overtime pay under the FLSA because they provide "companionship services" and are "live-in domestic workers." Because this was argued in the reply, it was not addressed in this ruling. HWS notes that under federal law, a live-in domestic worker under the FLSA is not entitled to an overtime differential, yet must be paid their hourly pay rate for every hour they work. While many states have laws that extend overtime protections to live-in domestic service workers, West Virginia does not. And the definition of "companionship services," as redefined in 2015, excludes employees who provide any type of general household work. This is important as true "companionship services" employees are excluded from minimum wage and overtime protections of the FLSA. In the case of the senior caregiving couple, it appears on the face that they were not in fact engaged in true "companionship services" as defined by the FLSA. The HWS Hourly Pay Rate Calculator exists to help families and their advisers properly translate a weekly wage into appropriate hourly and overtime rates to facilitate FLSA compliance and help avoid these type of civil actions after the fact. This points out the importance of a well written compensation agreement with all household service workers.